Nothing is quite as warming as a winter vegetable soup. Hearty, packed with nutrients and piping hot. Norway has a long history with root vegetables.They are grown in many parts of the country and can generally be easily stored. 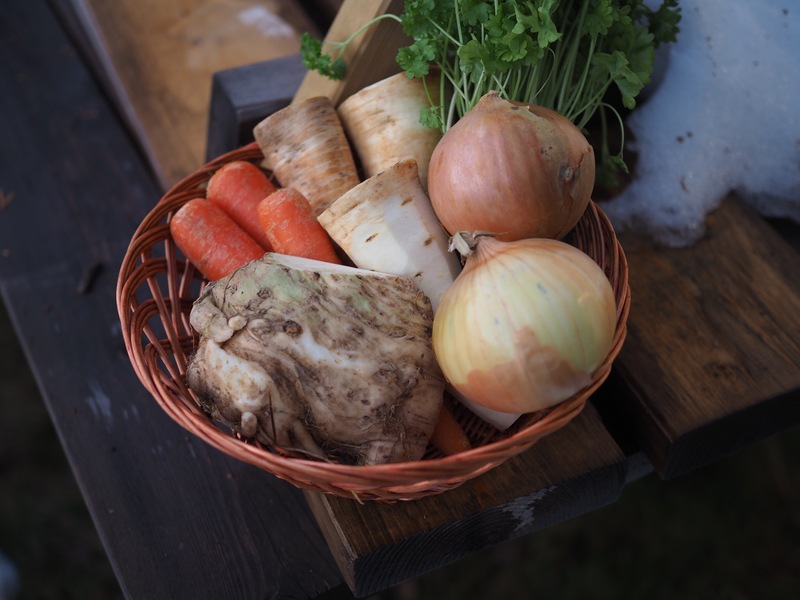 Norwegians do have their favorites of course – like rutabaga, carrots and potatoes – but more and more, others are being used more frequently in cooking, such as turnips, parsnips and beets. And the wonderful thing about vegetable soup is that you can use up what you have laying around and mix and match to your heart’s content. In this soup, I have used turnips, parsnips, celery root, parley root, carrots and potatoes to create a delicately sweet and balanced soup. Fresh thyme and parsley add a bit of distinction and to top it all off, crispy fenalår provides a well-needed punch of saltiness and texture. Fenalår is very symbolic of Norway and is eaten predominately throughout the winter. It is the meat from a sheep/mutton thigh which has been cured. The flavor of fenalår is so distinct and great on its own, yet by frying it, it turns into something similar to bacon – but if you ask me, much better. 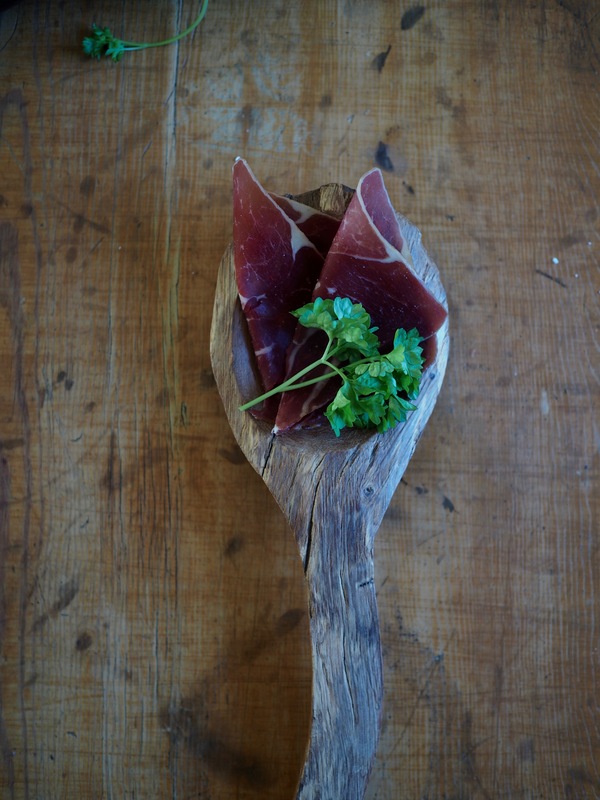 If you can’t get your hands on fenalår, then try substituting it with another cured meat or crunchy, spiced croutons for a vegetarian option. In a large, heavy pot over medium to high heat, melt the butter. As soon as the butter is melted, toss in the onions and sauté until golden and soft, around 12-15 minutes. Add in the parsnips, carrots, celery root and parsley root and cook for another 10 minutes until everything just begins to carmelize. Stir in the broth, potatoes, fresh parsley and thyme and simmer covered for another 25-30 minutes, stirring occasionally, until all the vegetables are soft. While the soup is cooking, put about 1 tsp of oil in a small frying pan over medium to high heat. When the oil is hot, take the fenalår strips and sauté them until they are crispy. Take them off the heat and put them aside. When the soup is finished, puree it with a hand mixer, or in a food processor. Return the pot to the stove, stir in the heavy cream and season to taste with salt and pepper. You may wish to add additional broth at this time to thin the soup out, depending on your desired consistency. Remove from the stove, and ladle into individual bowls. Top each soup bowl with a handful of the crispy fenalår strips and fresh parsley.